To encourage artists to lighten up and feel pride and inspiration (or at least amusement) in their old drawings, rather than shame. At first I was afraid that no one would contribute. Some artists feel so embarrassed by their old work that they hate looking at it, and would rather die than post it online for everyone to see. I know a guy who literally burned his old drawings on a bonfire. So I first tested the waters in an artist Facebook group, asking if anyone would be willing to participate. Thankfully, a lot of people were game, and ACID was soon up and churning out posts. Then social media superstar Jez Tuya created a hashtag called #anyonecanimproveatdrawing , which started trending on Twitter. Thousands of people started posting their old and new drawings on Twitter, and I invited my favorite ones to submit to the ACID Tumblr. Then Lauren Panepinto wrote about it in a Muddy Colors post, further increasing the blog's exposure. Thanks to everyone's submissions, ACID is going to be providing inspiration and encouragement for quite some time! 1. 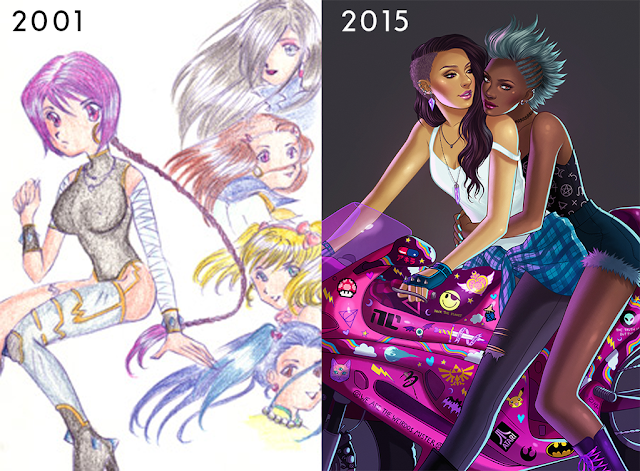 Many old drawings are fanart, especially anime fanart, while new drawings are more often original concepts. I think it's natural in our childhood and teens to draw the things we love, and it's great that anime inspires so many young artists. But eventually many artists seem to move on from these things as they come into their own styles. 2. Many old drawings are characters floating in blank spaces, while the new drawings tend to be fully realized scenes with environments and narratives. 3. Realism isn't always the goal. 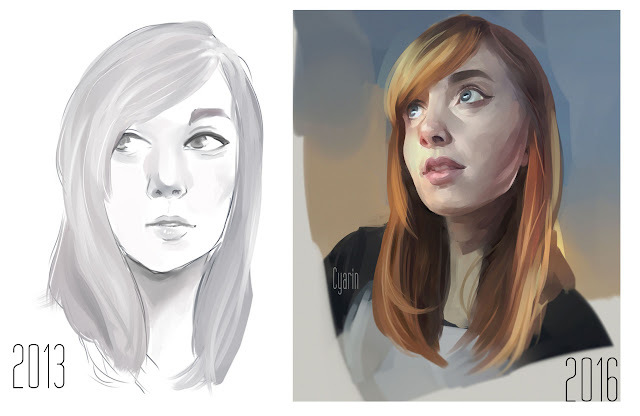 While most people's work became more realistic as they improved, some people's work became less realistic and more stylized, but in an intentional, consistent way. 4. We really do all start somewhere. 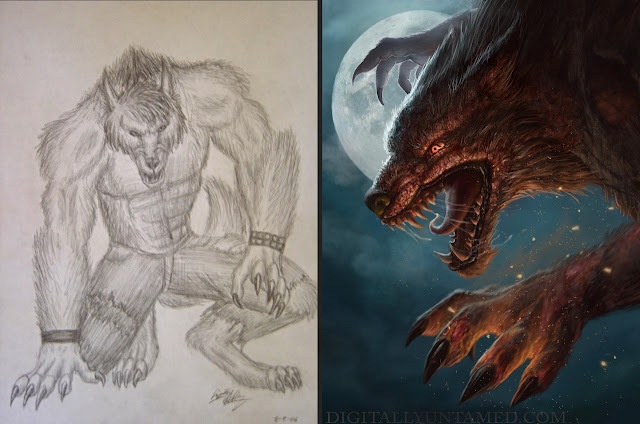 Some successful, professional artists whom I admire submitted to the blog, and I was surprised at just how bad their old drawings were. I thought that their old drawings would be better than other people's old drawings...but no. My favorite example of this is Noah Bradley's submission. No one would look at that old drawing and think "wow, that kid has serious talent!" (No offense, Noah.) He wrote a post about how he made an intentional, sustained effort to improve at drawing. Now he's a top-tier fantasy artist. 5. People improve at different rates. On the flip side, something that surprised and unsettled me about the submissions was just how little some people improved. Sometimes drawings they claimed were five or ten years apart were barely distinguishable. I can only assume these people weren't practicing very much. As a professional, this is a sobering thought. God willing, we're all going to live another ten years. We can spend that time improving a lot or improving a little. As Gandalf said, "all we have to decide is what to do with the time that is given to us." I hope you enjoy looking through ACID, and if you're an artist, whether a hobbyist or professional, consider submitting! Everyone is welcome.